Valletta 2018 together with the Valletta Design Cluster launched Baħħ Blu / Blue Void; a two-part multidisciplinary exhibition taking place at the Lower Barrakka Gardens in Valletta until the 15th of August. The exhibition is made up of two open-air installations; Book in the Sea and Poseidon. Book in the Sea, the first installation in Baħħ Blu / Blue Void, brings together cutting-edge marine technology and the process of writing literature, creating a book in the sea with the text of a poem rising from the depths of the Grand Harbour to speak to the audience standing at the Lower Barrakka Gardens. The poem is terse and much is left unsaid, highlighting the continuous emptying and replenishing character of the sea and human life. This installation is created by Japanese artists Atelier OMOYA and Space Production Lab and Maltese poet and book artist Glen Calleja. Poseidon, the second installation in Baħħ Blu / Blue Void, is an ‘attempt’ at raising awareness on the impact of fishing debris on the sea and marine life. 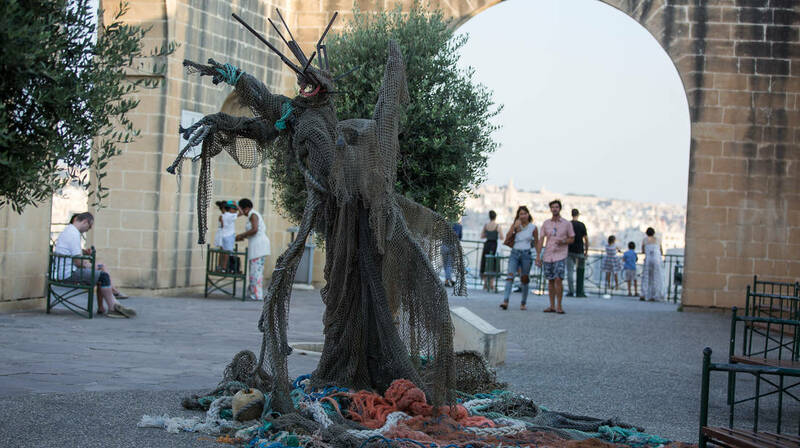 For this installation, the figure of Poseidon, god of the sea, was created using disposed nets recovered during Kawża Effett – an extensive clean-up targeting Maltese coastal areas organised back in June. The figure of Poseidon, triumphant yet helpless while entangled in nets and ropes, reminds us that marine animals including sharks, dolphins, seals and turtles suffer because of entanglement in disposed fishing nets and other waste, as more than 640,000 tonnes of fishing gear is left in the seas and oceans every year. This work is designed by local artist Jennings Falzon in collaboration with voluntary organisation Healthy Seas and its partners Ghost Fishing, Sharklab – Malta, and #Żibel. Poseidon is also part of the effett t’effett project led by voluntary NGO, ACT. Baħħ Blu / Blue Void is organised by Valletta 2018 together with the Valletta Design Cluster, a Valletta 2018 project which seeks to open new pathways for social engagement in urban regeneration efforts taking place in and around Valletta. It provides cultural and creative practitioners with dedicated shared spaces and opportunities for working, learning and collaborating, and promotes user-centered design as a driving force for economic and social well-being in Malta. For more information visit valletta2018.org and follow the Valletta Design Cluster on Facebook. Baħħ Blu is created by Atelier OMOYA and Space Production Lab and several participating artists, curated by Glen Calleja, and organised by Valletta Design Cluster, Valletta 2018 and ACT, in collaboration with EU-Japan Fest.